Merrell has collaborated with Vibram once again to produce an upgraded version of their barefoot predecessors. They are designed for natural running on hard surfaces and feature a durable Vibram sole, with a zero-drop platform and ultra-lightweight feel. The shoe claims to encourage a midfoot strike to support natural running form and increase strength in the foot, ankle and lower leg. They also feature a breathable mesh and protective toe cap. As I’m used to structured running shoes and am prone to injury, I was careful not to over-do it with these and eased myself into the barefoot way slowly. If you are thinking of moving to a more minimal or barefoot shoe it’s advisable to make the transition gradually to give your body time to adjust and strengthen. The shoes are true to their name and fit like a glove, which made me feel instantly supported. They also offer arch support and great flexibility. They come in a great colours too; the blue/green design really stands out from afar. Nervous to stray from the structured shoes I’m used to, I tentatively tried out a run/walk around the park. I loved the flexibility of the shoes and felt quite liberated. I also noticed that my running form changed slightly as it encouraged a mid-foot landing. 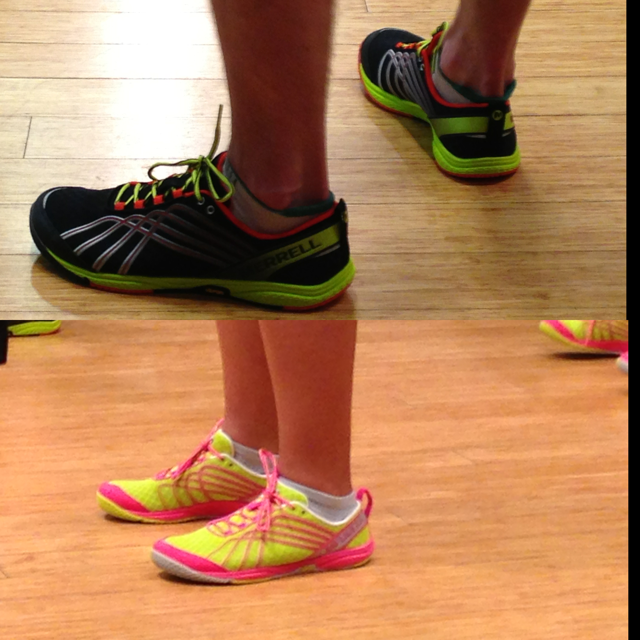 This entry was posted in Merrell and tagged Merrell, Running Shoes. Do Newton’s Forefoot Lugs Improve Running Economy?